Didn't they sell out to Express dairies in the 1960's !!!! There was a bottling plant on Whetstone High Street, demolished, I think in the 1960s. I went round it twice on trips from St Andrew's School in Totteridge in the 1950s. It was extremely noisy; I can clearly remember the sound of the full bottles going into the crates. I imagine that it was the only thing in the area which the school felt could pass for industry! 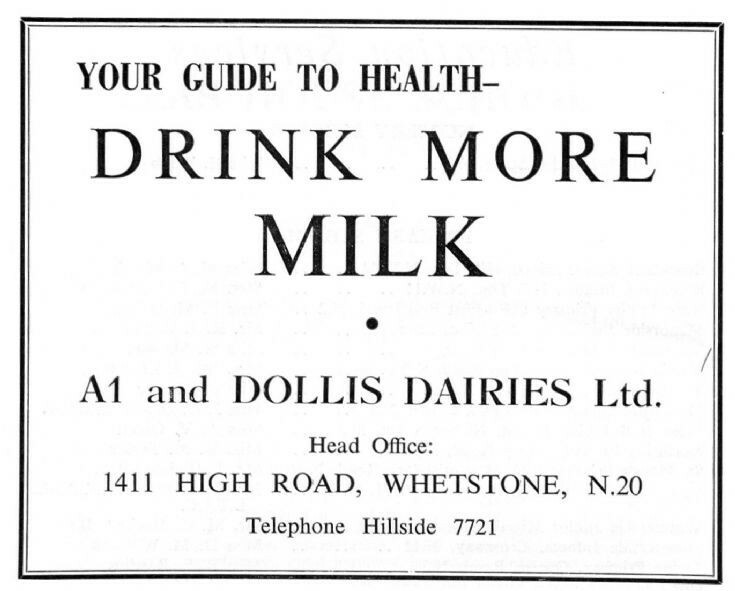 I've just purchased a Dollis Dairies milk churn and would like to find out the history of this Dairy. Can anyone help with this. I've managed to print the picture (above). Thank you. WOULD LOVE TO SEE YOUR MILK CHURN OR WOULD YOU CONSIDOR SELLING IT ?? In my early teens in the 1960s I helped a guy called Ron Ross on 3 milk rounds around New Barnet and Hadley Wood. The yard was originally on Lytton Road, New Barnet but then moved to Barnet High Street. Always remember he had a two tone Morris Oxford. Happy days! As a boy I used to help the milkmen at the New Barnet depot. I remember Sid Sheppard, Bill Ford, Ron and the Manager Mr Penton. The milk was delivered by a trailer lorry every day driven by Bob who then collected the empties. A new manager took over who had a new Austin A35 in green, he was always washing it in the yard. The Ron I remember drove a black Ford Popular and parked it opposite the old stables under the wooden barn. Hi Paul, would love to see any photos, It was one of the happiest times of my life and I can still remember many details with great accuracy. I used to go into the shop, there was a corridoor between the cold room and the office that led past the store room into the shop. I remember one of the ladies in the office had to sit on a pile of telephone directories to work at her desk. I seem to remember one of the ladies who worked the till in the shop was called Mrs Marsh, and there was a younger blonde lady who used to fill the shelves. Sid Sheppard sometimes used to give her a lift home, I think to Margret Road. There was also a tall dark haired lady who used to give me some of the free toys that came with the cereal packets, there were battleships, guns, submarines and a cardboard disc with holes which you spun to make a noise. The staff were very kind to me. Hi Dave, if you can send me your e-mail address I will send pictures to you. Mine is asmith14@sky.com. Will let my mum know about your visits to shop. She will remember names. My father's parents lived in Grosvenor Avenue, Barnet and grandad worked for A1 and Dollis Dairies. I remember him having a horse drawn milk float. Was probably late 50's or early 60's. His name was Tom Frost. My husband bought me a milk churn a few years ago with the dairy name on but I have no photos so would love to have more info of any sort. Oh there’s no name we just drive into the yard my director said it’s old Express Dairies. He has Deeds so can check. It’s right opposite the Sainsbury’s in north Finchley? Does anyone have any pics or info on the A1Dairies yard London Conley? My Dad ,Cyril Head worked as a milkman from mid 50's to 60,s. Electric hand pulled cart then to a milk float. I remember the "round" taking in Murphies Cafe, Kings Road etc. Hi again Peter Head, not sure what year this would be but my dad's manager was Ken Head, any relation? Paul . Thanks SO much for coming back. I'll check with my 95 year old mum today for the London Colney manager's name. Dad's round was St Ann's Rd, Shenley Rd, Napsbury Hospital etc. Sadly Ken Head no relation though. I'll do more research on the former site. My Dad used to take us to Whetstone (or was it Barnet?) for the annual A1 Dairies kiddies party before Express took over.